Energyzee makes the electrical energy consumers aware about the deep drowned reality and keeps them updated about emerging technologies in related industries. Energyzee team is endeavoring to develop a person with sound knowledge in electrical energy utilization and positive attitudes in energy saving, to face the increasing challenges in the industry. 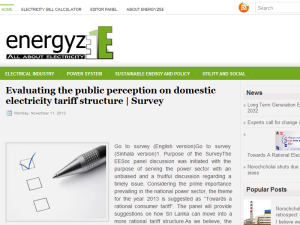 This what your EnergyzEE Blog Ad will look like to visitors! Of course you will want to use keywords and ad targeting to get the most out of your ad campaign! So purchase an ad space today before there all gone! If you are the owner of EnergyzEE, or someone who enjoys this blog why not upgrade it to a Featured Listing or Permanent Listing?